Is Ruby Red Grapefruit Juice Good for You? 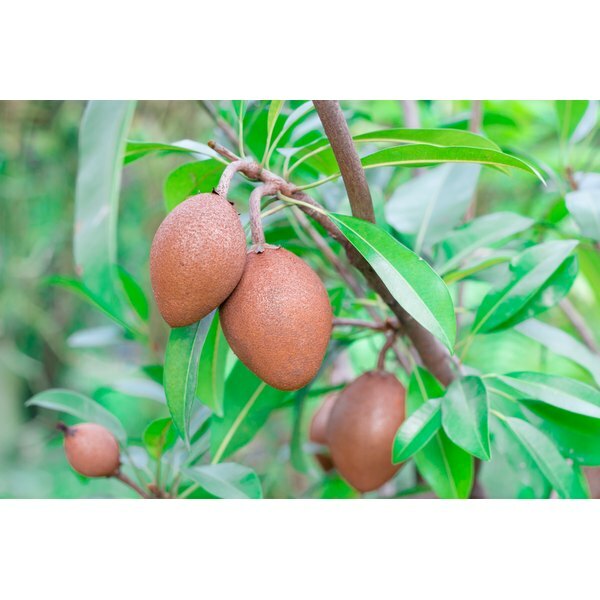 The sapodilla fruit is a tropical fruit, and it is also known as the sapote in Cuba, the dilly in the Bahamas and the chiku in India, according to Purdue University. Chicle, the main ingredient in chewing gum, comes from chiku, and you can also eat chiku as a regular fruit. Chiku is low in fat and high in dietary fiber, potassium and a variety of vitamins. You can benefit from eating it regularly as part of your overall balanced diet. Each cup of raw chiku provides 3.7 milligrams of vitamin E, or 17 percent of the daily value. The vitamin E in chiku is in the form of alpha-tocopherol, the most effective form of vitamin E in your body, according to the Linus Pauling Institute Micronutrient Information Center. Vitamin E is an antioxidant vitamin, and adequate intake might reduce your risk of developing heart disease and cataracts. Other good sources of vitamin E include nuts, peanuts, avocados and plant-based oils, such as olive, canola, corn and sunflower oils. A cup of chiku supplies 40 milligrams of vitamin C, or 67 percent of the daily value. You need vitamin C for proper fat metabolism, for fighting infections and for the synthesis of strong connective tissue for your joints, according to the Linus Pauling Institute Micronutrient Information Center. Vitamin C is an antioxidant that might lower your risk for heart disease, gout and cataracts. Vitamin C is in many fruits and vegetables, such as tomatoes, onions, red peppers, oranges, grapefruits and strawberries. Vitamin A is an essential nutrient for a strong immune system and healthy vision, and each cup of chiku contains 250 international units of vitamin A, or 5 percent of the daily value. Some of the vitamin A in chiku is in the form of beta-carotene, a type of carotenoid, or plant-derived pigment, according to the Linus Pauling Institute Micronutrient Information Center. Chiku provides additional antioxidant carotenoids, including lycopene, lutein and zeaxanthin. Beta-carotene is orange, lycopene is red, and lutein and zeaxanthin are yellowish. Each cup of chicku has 1.3 milligrams of vitamin B-6, or 60 percent of the daily value; 2.5 milligrams of niacin, or 13 percent of the daily value; and 0.2 milligrams of riboflavin, or 12 percent of the daily value. Niacin is vitamin B-3, and riboflavin is vitamin B-2. Many of the B vitamins are in meats, dairy products, beans, and fortified and enriched cereals, according to the 2010 Dietary Guidelines from the U.S. Department of Health and Human Services. Deficiency is rare if you eat a balanced diet. What Vitamins Does the Liver Store? Can Vitamins Help Break Down Belly Fat?